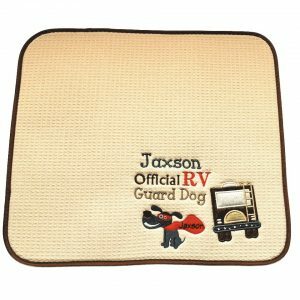 Practical accessories and assorted goods designed to make life easier and more enjoyable for RVers. Even if your pooch doesn’t fully appreciate having a personalized feeding mat from NotMomsEmbroidery, you’ll see benefits. 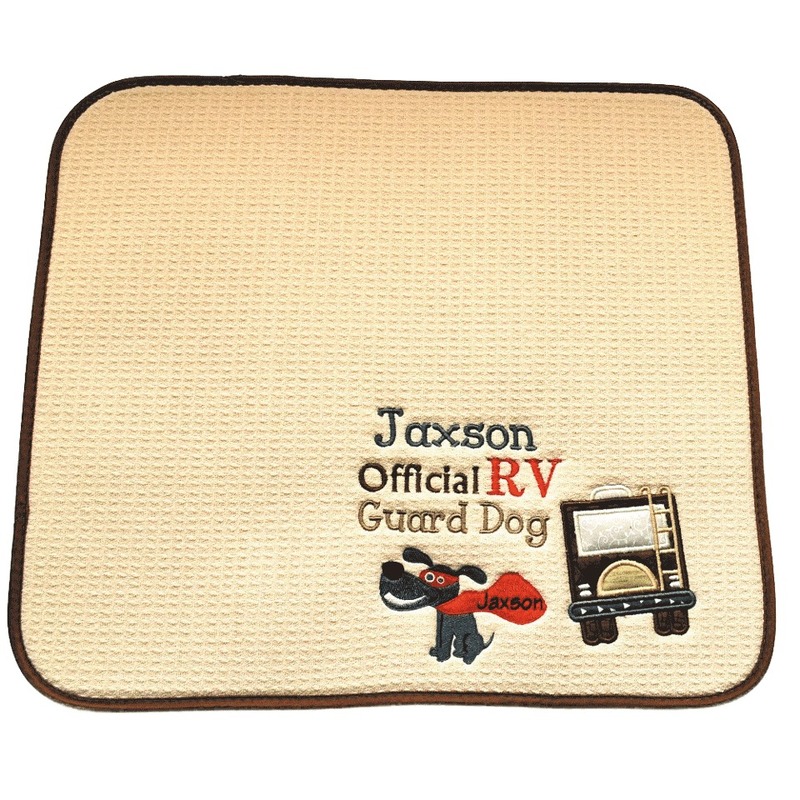 The mats, which measure 16 inches by 18 inches, are said to hold four times their weight in water, and they dry quickly to help keep messes off your RV’s floor. 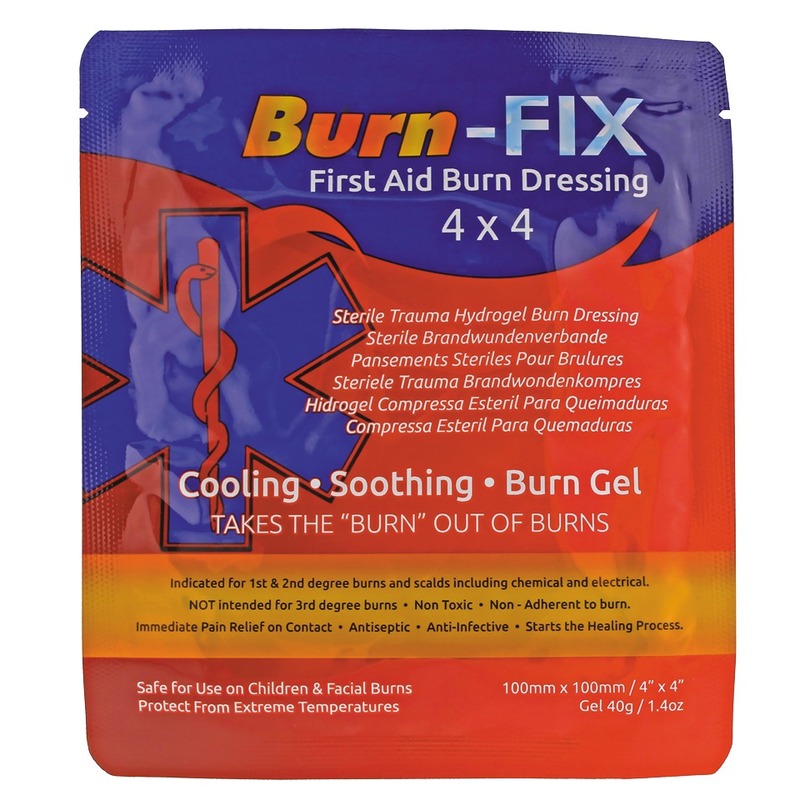 We hope your family never needs Burn-FIX, a first-aid burn dressing that is said to provide immediate pain relief. It’s formulated to cool and moisturize the skin, start the healing process, and help protect against contamination. 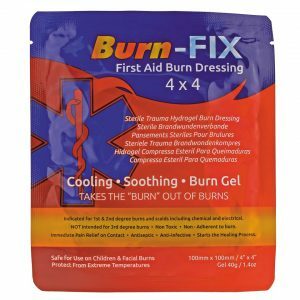 Burn-FIX’s proprietary formula contains tea tree oil, glycerin, propylene glycol, purified water, and emulsified silicone oil. It can be used for first-degree and second-degree burns; chemical, electrical, and grease burns; and razor burns and sunburns. Burn-FIX is available from Amazon in packs of two ($10.97); four ($17.97); and eight ($32.97). 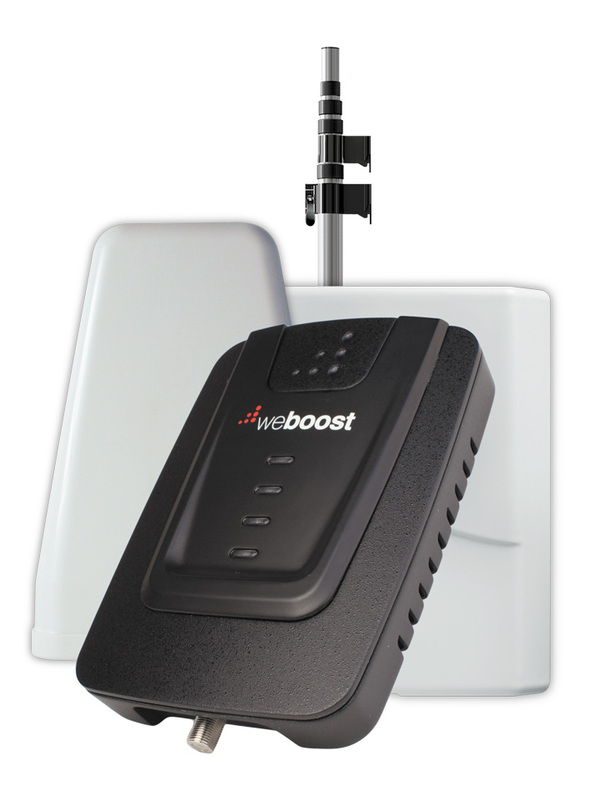 Wilson Electronics recently introduced the weBoost Connect RV 65, a cellular signal booster for stationary RVs. It’s compatible with all mobile phones and wireless carriers in the United States and Canada. The Connect RV 65 receives signals via a directional antenna atop a 25-foot telescoping pole. The antenna transmits the signals to the booster, which amplifies each of the frequency bands it supports using low-noise amplifiers and filters. All the components needed to install it are included. The price of the Connect RV 65 is $649.99. When you’re driving, it’s nice to have a dash cam to capture those “whoa, did you see THAT?” moments. 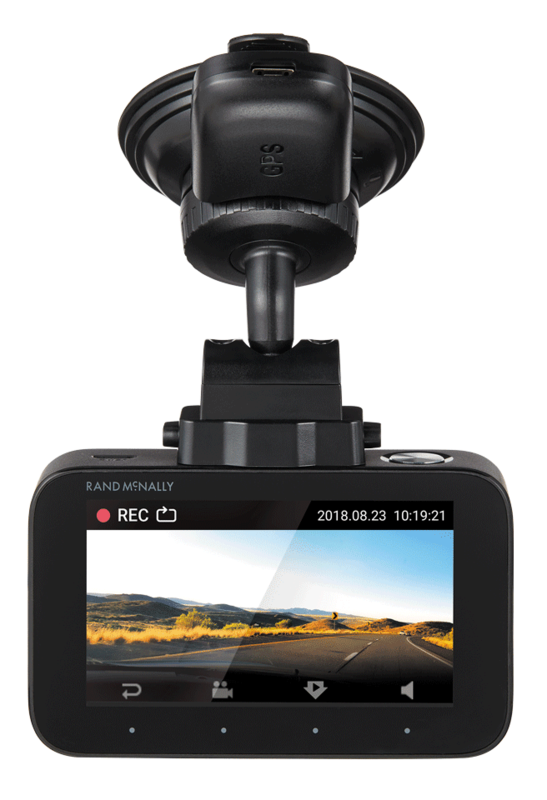 Rand McNally’s Dash Cam 500 records on a continuous loop in 1080p resolution. It has a flashback button that saves video to the camera, including up to several minutes of footage before you press the button. 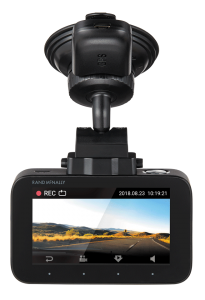 Other features include a built-in GPS to show where video was captured; a 16GB memory card; g-sensor technology that detects collisions and saves footage; a companion app for saving, organizing, and sharing video directly from a smartphone; and a clip-in suction cup mount that attaches the camera to the windshield. The manufacturer’s suggested retail price is $179.99. Stumped for holiday gifts? You can help people show their FMCA team spirit by outfitting them with a sporty jersey from the FMCA Store. 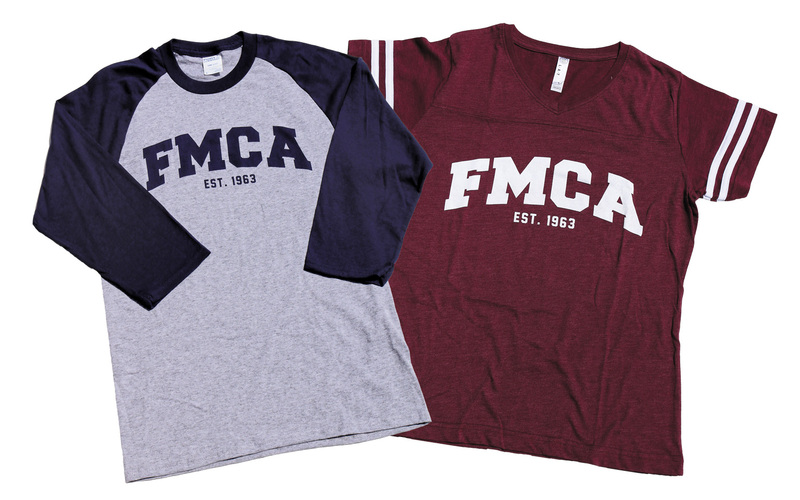 Men’s and women’s styles are available. The cost of each jersey is $16 (with exceptions noted below). The men’s jersey is 50 percent cotton and 50 percent polyester, including up to 5 percent recycled polyester from plastic bottles. The jersey is gray with blue on the sleeves/shoulder. Men’s sizes are small, medium, large, XL, 2XL (add $1), and 3XL (add $2). The women’s jersey is 60 percent cotton, 40 percent polyester. The collar is topstitched with a mitered V-neck design. The sleeves have stripes. The color is burgundy. Women’s sizes are small, medium, large, XL, and 2XL (add $1). Your motorcycle can explore places your RV can’t; so, of course, you want to bring it with you. Hydralift products make that possible. The HL4288, which can be installed on most Type A motorhomes, is a hydraulic power lift with a loading ramp that drops almost flush with the ground. The lift’s automatic locking system secures the bike. The HL4288 lift has a carrying capacity of 1,000 pounds and also makes it possible to tow a vehicle, boat, or utility trailer weighing up to 8,000 pounds (depending on motorhome chassis specifications). The price is $4,808. The Hydralift 502474 is a bolt-on lift that fits most Type B and C motorhomes. It features a hydraulic electric actuator. The lift can carry up to 500 pounds of cargo and tow up to 5,000 pounds. The price is $3,883. Like an open bottle of wine, gasoline in a motorhome’s fuel tank will degrade over time. So, if you put your coach in storage this winter, you might want to consider adding Sta-Bil Storage Fuel Stabilizer to the tank. According to the product description, Sta-Bil keeps fuel fresh for up to 24 months. Other benefits: Sta-Bil removes water to prevent corrosion; it cleans carburetors and fuel injectors; and it protects the engine from gum, varnish, and rust. It is effective in both ethanol and nonethanol gasoline. A 32-ounce container treats up to 80 gallons of fuel. The manufacturer’s suggested retail price is $13.99. A veteran of years of RV travel, Dennis Baggett of JD Solutions LLC has seen his share of sewage spills while parked near other RVers. 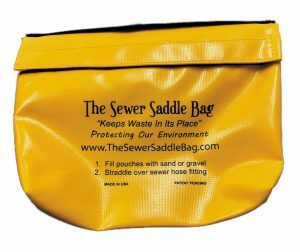 Those experiences led him to develop the Sewer Saddle Bag, which is made in the U.S.A. using 18-gauge nylon-reinforced vinyl. First, you fill both sides of the washable yellow bag with sand or gravel to give it heft. Then, after attaching the waste hose fitting to an in-ground sewer pipe, you straddle the Sewer Saddle Bag over the sewer connection. The bag’s weight helps ensure that the connection remains secure. With each purchase, JD Solutions donates to Operation Heal Our Patriots, a program for military veterans run through the nonprofit Samaritan’s Purse. 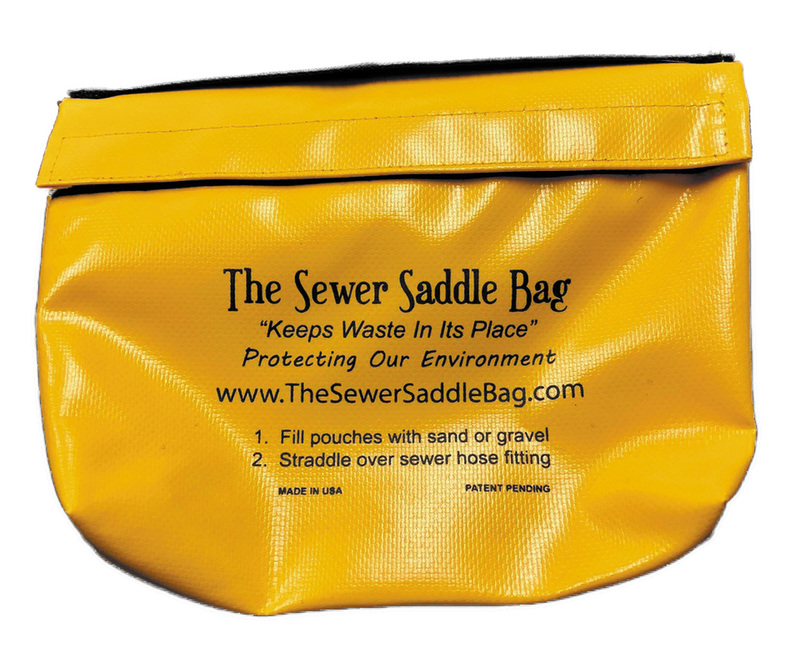 The price of the Sewer Saddle Bag is $24.95. 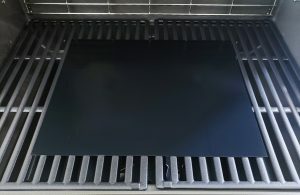 Grillmeisters say grill mats offer many benefits, such as: You can cook anything on them; juices and sauces don’t drip off; and you can use a grill mat on a communal grill without worrying about grate cleanliness. Added benefits: no flare-ups while cooking and easy cleanup afterward. Kona Best BBQ Grill Mats can handle a peak temperature of 600 degrees, with 500 degrees the recommended searing temperature. The nonstick mats are available in two sizes: 16 inches by 13 inches (two mats for $19.95) and 25 inches by 17 inches (one mat for $20.95). They can be cut with scissors to fit any size grill. And, they can be used for baking.